Round seven was a big weekend for the Toronto Dingos Football Club with two wins from two games. Div.1 hadn't won since their 116-pt win against the Wildcats five weeks ago. Div.2 lost their first game in two seasons against the Rebels last weekend. Both teams were looking for strong performances. Dave Wells, Ben Kavenagh and Paul Tinkler all kicked bags for both teams. Division 1: Toronto Dingos v Broadview Hawks, U of T Scarborough. Div.1 scored their first win since June 7 thrashing the Hawks by 58-pts at U of T Scarborough on Saturday. With both clubs missing a slew of regulars, the Dingos and Hawks agreed to play 16-a-side of the smaller UTSC ground. With Big Wade still away, coach Robbo changed the lineup, slotting longtime fullback Wellsy into the full-forward position and he didn't disappoint bagging five goals for the match. After a tight first quarter, Div.1 applied the pressure and turned the screws as they skipped away to a four-goal lead by the main break and only got better as the match wore on. After quarter time Div.1 had control of the match and run away with the game in the second half by 58-pts to claim their second win for the season and kept their final's hopes alive. Spider Wells played an enormous game in the ruck in the absence of Tom Bell and contested well in every tap. Heath Neville switched to full back and held the defence together with Shaun McKay as they kept the Hawks to five goals for the match. Colin Turner Bloom played one of his best games of football for the seaoson booting two goals and provided a target across half forward. The midfield trio of Alex Aitken, Geoff Hansen and Tom Humphries were again at their hard working best kicking goals and winning the contested ball. "I'm happy for the boys. They've been playing good football over the past 3-4 weeks and just glad they got a win today," said Coach Justin Robertson after the game. "Wellsy has never kicked five goals in a match before, so, really happy for him, being a defender, he got to experience that." Next week is a must-win game versus the Central Blues, who sit right above the Dingos on the ladder. The Blues have been in strong form recently, so the Dingos will need to be at their best and bring their hard-nosed footy to steal a win. Best: Dave Wells, Alex Aitken, Shaun McKay, Colin Turner Bloom, Heath Neville, Everett Wells. Goals: Wells (5), T.Humphries (2) , C. Turner Bloom (2), S.McKay, A.Aitken, R. Haycraft, C. Buczkowski. Division 2: Toronto Dingos v Broadview Hawks, U of T Scarborough. Div.2 hit back in round seven with a commanding 100-pt win over the Broadview Hawks at U of T Scarborough on Saturday. Played in humid and hot conditions, Div.2 led narrowly at quarter time before piling on the goals in the second and third quarters, making the final term a rout. 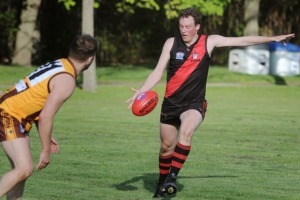 It was a day out for the Dingo forwards as Ben Kavenagh booted six goals, while his lanky partner in crime Paul Tinkler dribbled through five majors. Rainer Haycraft and skipper Alvin Ranchhod racked up plenty of touches in the middle and kicked two goals each. George Craig dominated centre taps and Tyler Penell was busy in defence. Div.2 take on Central Blues this week in what is a must win. Both teams sit on eight points on the ladder but Div.2 have only played three matches. The Rebels sit on top with four wins from four matches. Best: Ben Kavenagh, Alvin Ranchhod, Paul Tinkler George Craig, Tyler Penell. Goals: B. Kavenagh (6), P. Tinkler (5), R. Haycraft (2), A. Ranchhod (2), R. Cox (2), C. Pereira , C. Serpa.